Executive Chef Santiago Kantun of Xtabay Restaurant at Ceiba del Mar Beach & Spa Resort in the Riviera Maya, Mexico shares an exciting taste of the region with his recipes for a sumptuous four-course menu. I had the opportunity to meet with Executive Chef Santiago Kantun during my stay at Ceiba del Mar Beach & Spa Resort in May 2008, where I experienced his creative cuisine at Xtabay Restaurant. 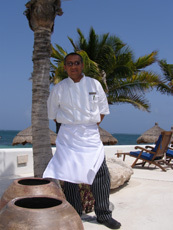 Chef Santiago Kantun was born in Telchaquillo, Yucatan, Mexico and his culinary focus is creating haute Mexican food with Maya elements, with a result that is not only beautifully prepared, but also in keeping with the resort's focus on showcasing the Maya culture. Chef Kantun graciously shares his recipes for a four-course menu that will whet your appetite until you can travel to the Riviera Maya to personally experience his imaginative menu. Method: Preheat a pan, add the olive oil, and sauté the shallots and the mixed seafood. Flambé with the white wine. Immediately add the fish broth, tomato puree, red curry, and diced tomatoes. Boil for approximately 15 minutes, and then add some red curry, salt, pepper, and finely chopped cilantro. Serve immediately in a large soup bowl. Method: With a knife, make a few cuts on the fat part of the magret, and then sprinkle with sugar. In a very hot pan, sear the magret on both sides, no more than 2 minutes per side. Remove from heat and reserve for another 2 minutes. Prepare the vinaigrette using the olive oil, vinegar, coconut milk, salt, pepper, and finally the zambal. Make the jicama marmalade by sautéing jicama in julienne, leeks, onion, and garlic, and then adding the bay leaves, sugar, white wine, and apple vinegar. Bring to a boil to thicken. Presentation: Arrange the radicchio, arugula, and chives on the previously baked Parmiggiano basket. Place the basket with the greens, the jicama marmalade, the sliced duck, and the vinaigrette in a shot glass. Method: Place a layer of goat cheese and sundried tomatoes on the beef tenderloin, and then roll it and tie it firmly, add salt and pepper, sear in a pan with olive oil. Place the tenderloin on a baking pan and place in the oven for 15 minutes until the beef is medium rare. Cook the vegetables and sauté the mushrooms. Deglaze the pan with beef juice, red wine, and then add the rosemary, and season to taste with salt and pepper. Presentation: Slice the beef tenderloin, remove string, and place the sliced beef in the middle of the plate. Add the mushrooms and the vegetables. Garnish with fresh rosemary. Use colored oils (green herbal oils, etc) to enhance the presentation. Method: Peel the apples, remove the core, and cut into 8 slices. Pre-heat a pan with butter. Sauté the apples, and then add sugar, raisins, cinnamon, and white wine. Cook over low heat for 10 minutes, until the apple juice is reduced to 25%. Once cooked, reserve the filling. Roll out the phyllo dough, cover with melted butter, and repeat 5 times. Fill with the apple mixture, roll it, and brush it with butter. Bake it in the oven for approximately 10-15 minutes. Serve on a plate with vanilla ice cream and lychees. Please read other articles on Ceiba del Mar Beach & Spa Resort in the Hotels and Resorts, Restaurants, and Spas sections. Please read other articles on Riviera Maya in the Destinations, Hotels and Resorts, Spas, Restaurants, Chefs' Recipes, and Adventures sections. Read other articles on Mexico in Destinations: Cancun, Hotels and Resorts, Restaurants, Chefs' Recipes, Spas, Liquor Cabinet: Xtabentun, Adventures: Scuba Diving in Cancun, Music Scene: Interview with Paco Renteria, Music Scene: Paco Renteria - Gitanus and Oceano, and Travel News: Luxury Avenue. For information on Riviera Maya, Mexico, please visit the website: www.RivieraMaya.com. © August 2008. Luxury Experience. www.LxuryExperience.com All rights reserved.